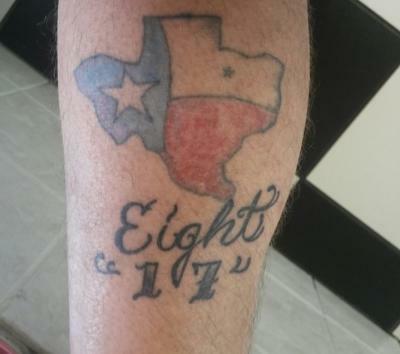 Do you know someone with an 817 tattoo? 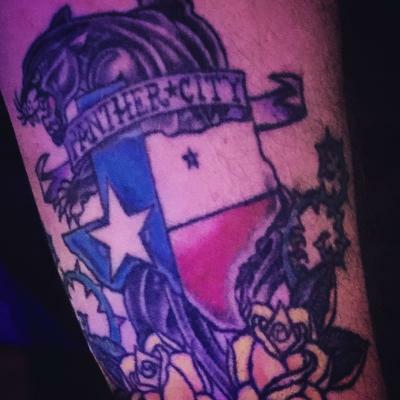 More and more locals are declaring their love for Fort Worth in ink. This being August 17th, a.k.a. “8/17 day," here are some fun stories about Fort Worthians giving and getting 817-themed tattoos. I started my search by chatting up Ink817 Tattoo Company owner Josh Gonzalez. His tattoo shop, located just north of the Cultural District, opened last May. Gonzalez has “817” inked along the side of his middle finger, something he had done 12 years ago. Requests for local or state-themed images are common, he said. Fort Worth Barber Shop owner Jonathan Morris permanently inked the Fort Worth Convention & Visitors Bureau logo on his bicep last month. One of his employees referred Morris to Near Southside-based Fade to Black Tattoo Company for the work. For others, the tattoo acts as a reminder of home. Take longtime Fort Worth resident Randy Sullivan for example, "I was living in California at the time and I wanted a Texas tattoo to keep a reminder close to me of my hometown." Artist Adrian Evans did the ink while Sullivan was on vacation back home in Panther City. Saxophonist Jeff Dazey has shared many stages with R&B singer and guitarist Leon Bridges. What fans may not know is that both musicians have 817 tattoos. 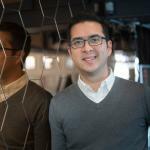 Dazey shared their story. “We flew to Oslo, Norway, to start off our European tour last year,” recalled Dazey. “Randomly, one of our friends from Dallas, Jonathan Tyler, was there playing a show with some friends. Some of them, as it turns out, had been getting tattoos. So Leon and I decided to get ‘817’ on us. It was the quickest tattoo decision I’ve ever made, and it was Leon’s first tattoo. Plus, it was a ‘stick and poke tattoo,’ also called a prison-style tattoo." Even when the ink job doesn’t go as planned, it at least ends with a good story. Near Southside resident Chris Garner shared his funny memory. As I finished my visit with Gonzalez, a handful of TCU students perused the shop. The biggest change the tattoo industry has seen, Gonzalez said, is the destigmatization of body art.